Umbrellas are cool. They are compact, but them open up to be big and useful. Measure the size of the umbrella closed and then measure it when it's open. How many spokes come out from the center to make your umbrella? How many joints are on each spoke? 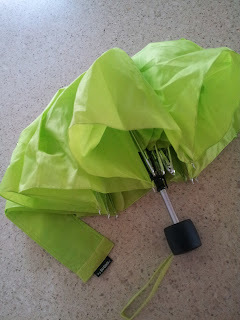 How would you design an umbrella? Draw a new type of umbrella. Did you use math to make it symmetrical? Get some chalk and when the sun is shining draw the shadow of an umbrella's shade at it's lowest point (closest to the ground). Then draw the shadow at the highest point you can hold it. Are the areas much different or almost the same? Measure the time it takes for an umbrella to fall from the same distance when it is closed vs. when it is open. What can you do with math and umbrellas?